In backlash at Shas minister's statements against non-Orthodox Jews, Jewish Home minister releases a terse tweet. 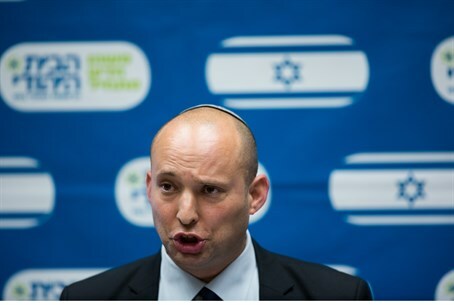 Education Minister Naftali Bennett (Jewish Home) on Wednesday weighed in on the controversy that erupted after Religious Affairs Minister David Azoulay (Shas) said in a radio interview that he did not consider Reform Jews to be Jewish. Azoulay's statements, which have already led to a backlash from American Jewish leaders, led Bennett to issue a terse condemnation on Twitter. "All Jews are Jews. Whether Conservative, Reform, Orthodox, haredi or secular. And Israel is their home. Period," wrote Bennett. Speaking to Army Radio, Azoulay had said that, "any Jew who observes the Torah and commandments is for us a Jew... A Reform Jew, once he does not follow the religion of Israel – then let us say, there is a problem. I cannot allow myself to say that he is Jewish." He immediately added: "These are Jews who took a wrong turn along the road and we need to ensure that every Jew will go back into the fold of Judaism and accept everyone with love and joy... we would like for all of those Jews to go back to Judaism according to halacha [Jewish law]. That is all." Orthodox Jews who strictly adhere to the laws of the Torah view Reform and other non-Orthodox theologies as illegitimate, due to their departure from Jewish law and even rejection of the Divine nature of the Torah. As such, "conversions" carried out by non-Orthodox streams - including Reform - are not recognized by Orthodox Jews. However, Azoulay's assertion that Jews who identify as Reform are no longer considered Jewish is not based on any authoritative ruling of Jewish law.